A hard-drive crashed on me, and I thought I had lost this shot. Originally, I stopped this woman because I loved her salt & pepper hair. It wasn’t until we began speaking that I noticed the very subtle bit of sparkle on her cheeks; such an unexpected touch for a Milanese lady, like this. It wasn’t until even later, when I was working on the image at the hotel, that I noticed the smudge of sparkle on her earlobe. This lady is chic. I'm always so afraid you'll just showcase the fashionistas and forget about the true gems. a nice way to add "diamonds" to one's look! i have to say i love this shot very much- such emotion in it. i am drawn to her. that she uses sparkle to do so much yet is able to keep it simple is perfection and that it compliments the hemming of her scarf is also intriguing. i love that you stopped her, i love evem more the way you captured a feeling. Not only chic, but beautiful too..
A very interesting old lady! Very elegant. The way you photograph people makes me feel like I already know them, or they remind me of someone I love. There is immediate connection and emotinal response. This photo is amazing. I keep looking at it. Such a classic beauty. I hope I have this much sparkle in my golden years. I like the polka-dot scarf. 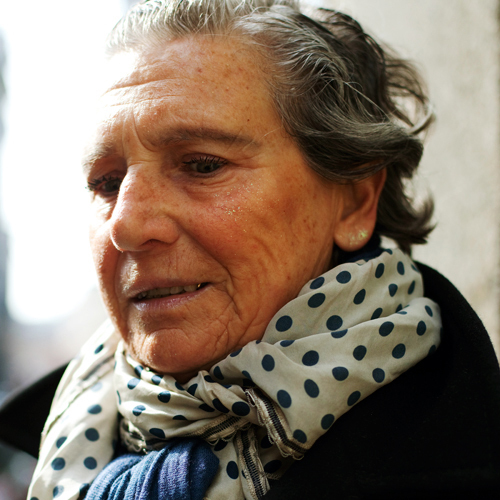 And this woman wears a faliero sarti scarf…really very elegant! Love it! She hasn't lost that sparkle indeed. Gosh, such an amazing woman! <3 So nice to see diversity in a world craving for newer and newer people… You only see teens right now! So, this is really FRESH! This is so lovely in so many ways! I love too much your sense of beauty, Mr Scott! What a beautiful woman! She reminds me my grandma. it's an amazing picture… how lovely ! I love it! I also love the fact that her eyelashes are curled as well…..
and here i worry that my love of sparkles, even now in my 30s, is somehow not age appropriate. they're so unexpected and i imagine gave her much joy as she rubbed them on. I loved her salt & pepper hair. cool huh! A romantic thought to think it intentional, but my instincts guide me to believe that this gorgeous lady makes toys, dolls or perhaps craft of somekind and the glitter/sparkles are lovingly placed by mistake…. Still a magical moment captured <3. This lovely woman is also wearing a wonderful light pink/mauve lipstick. She reminds me of my mother – beautiful forever. very much like the way you put it…always love your sense of beauty. Why is a smudge of glitter on an earlobe chic or fashionable? I adore this. There is something very poignant about this shot, and the sparkles. I would like to be like her when I grow up. Beautiful close-up – in her younger years, her eyes would have sparkled even more! Wow, this is amazing. Your photos are inspiring, and capture the mood and tone of the person. I love how close up this picture is and that I can see the soft wrinkles of her face.. I am very inspired by your new style of shooting the pictures! And the subjects are going beyond the stylish girl with the it-bag. I think true fashion is the real life with all its defects! What a sweet surprise. The subtlety and charm is so lovely.. and tres chic. Her facial expression makes this image look like a modern painting. She seems very interesting. The sparkle idea is so cool. I'm impressed. I've never seen anything like that!She's also wearing mascara and the lovely scarf. I can understand the sparkle on the cheeks but…the earlobe? I wish I could know why she decided to do that…innovation? an old make-up trick from when she was young? she's the living proof that a woman can be beautyful, chic and lovely with a lined face and grey hair. no botox, no lifting, no hair-dye for this lady. and I think she's got more charm than all those plastic dolls in hollywood. The scarf is tied in an impressive fashion. I love that she has not Botoxed her life experience away. I'm going to try this myself later ! definetely agree Sart – very chic indeed!! love the soft folds in her face as she's aged so gracefully…and I also love that she still has a hint of gloss and mascara on her face…beautiful natural shot! What a beautiful, beautiful lady…so gracious in her maturity and a great sense of fun with her sparkle! It brightened my day!! What a beautiful woman, you can see the soul in her eyes and the youth in her heart. She is just so real. It looks like this lady may have been playing with her grand-kids who were drawing and playing with glitter. She was helping them and accidentally put her hands on her cheek and her earlobe. She reminds me of my grandma who, at the age of 84, told me she regretted never getting that tattoo of a butterfly on her shoulder! this woman is the embodiment of how to age gracefully. and i love her scarf. This is a beautiful portrait. I love to see older people featured, they have so much to offer us. Look at her lovely scarf and gentle face. And yes, the sparkle! I like so much your blog, and all the outfits from people!!! Yes, she is chic and she proves that chic has no age.Discret charm. There's so much beauty in embracing your age but being young at heart. This shot is wonderful! L'espressione di questo viso dice piu che mille parole… Bellissima foto. the sparkles are intentional .. they're not art and craft sparkles. they are sparkly moisturiser, can get them from bodyshop amongst other places. that and the hint of mascara… not many commented on that … her eyelashes just stand out ..
she must've been so gorgeous in her younger days. she still is now! and a very strategically and well tied scarf! looks like she sporting mascara too. When I grow up even more, I want to be just like her. My kindof grandma, so lovely. Not just chic, she's got an ageless, playful spirit and it shows on her face: the sparkle and the fun yet subtle makeup (eyebrows, lashes, gloss on lips), her eyes, the softness of her skin, her expressive mouth. She is a cool cat and I suspect she's actually an artist (or at least an artist of life). Thanks Scott, you do have a unique eye for beauty. Also is that silver thread on the edge of her scarf? She's beautiful. I too love this photo, proving that a woman can still be attractive at any age. I do, however, cringe at all the comments about 'grandmas'. Why grandmas? I know, I know, the age gap. Definitely going to take inspiration from this and put a bit of glitter on my own ears instead of earrings. really? When I see the title the first thing I noticed was the sparkle on her teeth, unless it's my computer playing tricks on me. For me this is the most beautiful image I've ever seen on your blog. And I'm smitten with many of them. The glimpse of her gold tooth matches the sparkle on her cheeks and earlobes. I noticed the smudge on the ear first..
with all the hair-dye in the world and our obsession with youth (which is as old as the hills) i seldom see anyone with salt and pepper hair. i don't think it looks bad – quite the contrary, when worn well it looks amazing!!! and those who pass on the dye are the real mavericks. when i get old i want to wear my silver hair with confidence – it will be fantastic! I didn't even notice the sparkle on her cheeks until you mentioned it. Reading further, you pointed out the sparkle on the lady's earlobe – again, I hadn't noticed it. Subtlety is chic. What an inspiring picture. Are you sure she made it on purpose ? I am getting near her age, and i have accepted aging as it comes. wonderful freedom in that. like this beautiful aristocratic lady, I enjoy spending time putting my outfit together. i always try to add just a dab of sparkle to my classic approach (although i never thought to do it literally) such fun. lovely women such as she are my models. Scott, this is amongst your very, very best. so moving. Thank you and Keep 'em coming! She looks like she has a fantastic life story to tell..
she looks happy about her life. Love this kind of photos! this is one of my favorites you've ever posted. she is too darling for words. ..and the touch of sparkle of the gold tooth. LOVE the earlobe sparkle, even if it is accidental. So much love and subtlety in this shot, so close to the face, and not necessarily the most conventionally flattering angle. The earlobe and eyelashes and chin tilt–divine! Love the sparkle of her gold tooth, too. okay here goes! hope what the following i say/write makes sense cos it 2.20 in the morning and i have a few jars on me but as usual I have to check in with the sart. This 'foto is dope. It is hands down my new fave and the other one that was a fave before it was on the cover of Sart's book was the Julia one. hope you get my gist and don't edit the sincere and earnest and just a tad bit merry. When we were kids we'd play "beauty parlor" with my Babcia… we'd put lotion & powder on her face, braid her hair, and generally fuss over her. I can picture this woman doing the same with her grandchildren–and being perfectly happy to wear the result out in public. In the end, no matter who added the fairy dust, she looks great! Besides the sparkle I don't think I have ever seen an elderly Lady with mascara… gives her such a bright and young touch! I can only imagine how she was, back in the days when she was still young. The sparkle is just so chic, but I really love her eye lashes too! There is such an elegance in Milan! 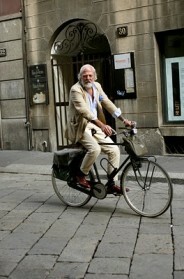 I am currently working on project photographing style elegance in the streets of Milan! Well, she is a beautiful lady! 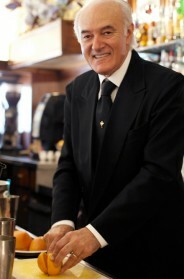 And Milan is just Milan, which – even to an Italian, non-Milanese like me – means elegance taken to the limit!!! Love the unexpectedness of that sparkle!! A beautiful portrait of a beautiful woman. Sparkles on her cheek, earlobe, tooth, and in the hint of a sophisticated smile… I'd like to listen to her telling her story. This is very interesting. When I was 12 back in 1974 I was reading a Seventeen magazine article about girls at the Sorbonne. I will always remember the one girl with lots of scarves who added sparkle to Noxema and wore it on her cheekbones. Been hooked on Paris Street fashion ever since. And look at the way she wears her scarf – is that a Milanese trick? I remember the guy in the film … was it in March? There's nothing like the visual surprise … they rarely occur except here on your blog. She is lovely and stylish in so many ways … even sans glitter. filing this photo as a reminder to myself. so that i can look at it many years from now and see that there is nothing wrong with growing old as long as it's done gracefully and a bit of sparkle. adore the feeling evoked from this moment. amazing shot. Just loved this picture! Pure poetry sweet lady look!!! nothing like a glitter granny is there?